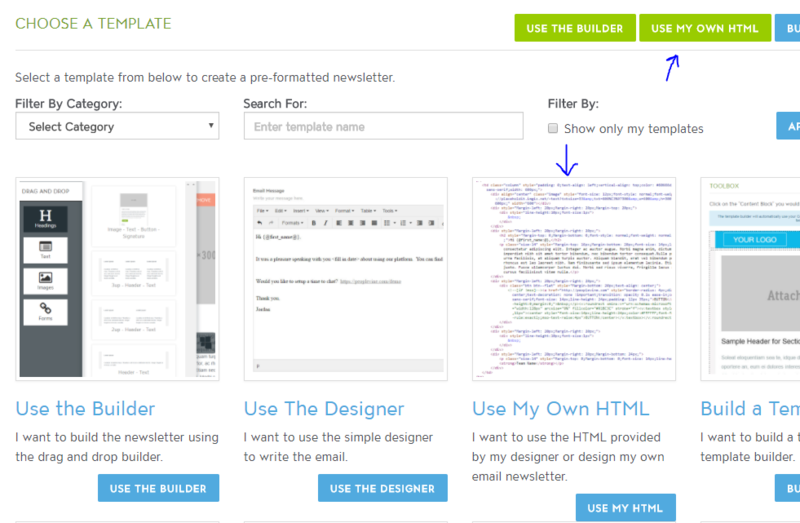 copy and paste HTML from another platform into content pages, email newsletters, templates and layouts. Within PeopleVine, there are two main areas you would use HTML in the platform. This would be content related such as landing pages, web layouts and content templates, along with messaging related such as newsletters, newsletter layouts and newsletter templates. When creating a new page or email, you can switch the Page Type to use Straight Up HTML which generates your provided HTML as is (no wrapper/layout). or you can change the How do you want to build this page? to Use HTML Editor and leverage a layout and other abilities for content pages. You will then see the HTML box to paste in the HTML code. When in newsletters, you will find the option to Use My Own HTML when using the new wizard. or by selecting Use My HTML under the Design Template dropdown.